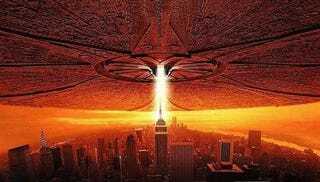 Apparently one movie isn't enough to contain all the ideas Roland Emmerich has for his follow-up to Independence Day. The director is planning to make two sequel films, and he already has a punny title in mind. It's always about earth and that earth gets invaded. He also reiterated that the idea involves Will Smith and that the sequels would, like the original, focus on a "king who leads his troops into battle against an evil force, and that stays like that." So what title has Emmerich suggested for this opus? 'ID4-ever,' Part I and II maybe? We'll have to wait and see if he's joking.